I used to be a speakers guy about 20 years ago and went through the same GAS-induced ritual many of us did back in the day to keep up with the advent of CD, DVD than Blu-Ray. I stopped at 5.1 before converting back to 2.1 and headphones. Before moving countries, I had to kiss goodbye to a B&W Series 2 system to rather lovely Polish audiophile couple who took it, cables, desk and all. They seemed happy. I never got around to replacing it, blame that on a certain Little Dot MK2 tube amp and a spare set of Grado SR80’s and the birth of our son. Collateral damage and noise kept to a relative minimum for many a year since and quite happily so. Yet, by 2012 back came a small set of desktop active speakers, a pair of D1010MKII 08’s from Swann and right away I knew I was missing a piece in the audio jigsaw. A good pair of speakers is hard to replicate with headphones; they are sometimes two very different beasts for different occasions and moods. Yet the Swann’s were a touch overkill for the cramped office so when Celsus Sound suggested I take their new SP One active speakers for a spin as an alternative for smaller rooms (and a possible upgrade) I was intrigued. This is a $649 active bookshelf speaker. A price on par with some of the B&W bookshelf speakers I had enjoyed so much 15 years ago. 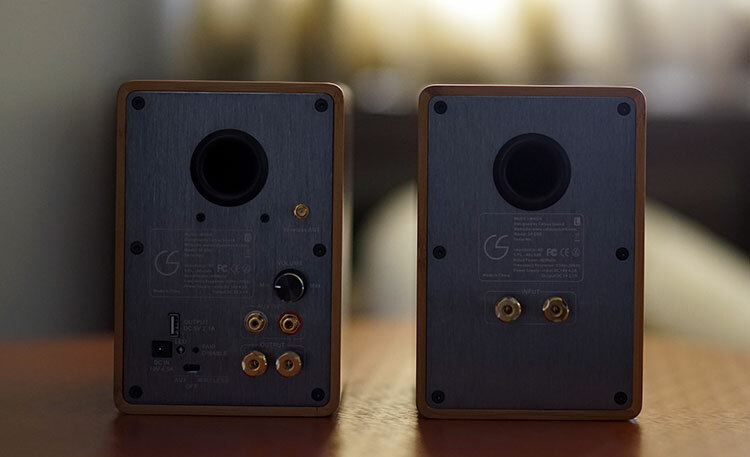 The SP One is a single woofer, single tweeter small active bookshelf speaker rated at 60W into 6 ohms that ships in passive, or active configurations and also includes wireless connectivity via Bluetooth. It is primarily targeted to desktop 2.1 audiophiles looking for a tangible upgrade on a budget or mid-fi wired speaker system but want to retain a degree of flexibility by being able to stream their music from other sources such as DAP’s, smartphones or media centers. 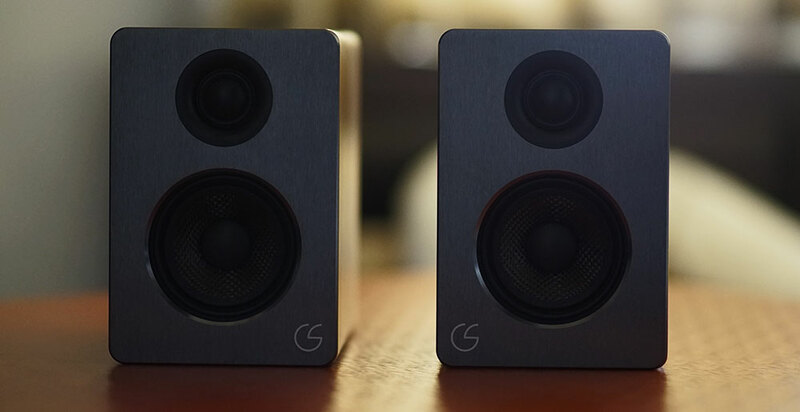 At $649 the SP One is a serious pitch at hi-fi enthusiasts as well as modern consumer needs. Most importantly, for those integrating with computer based audio, Celsus Sound claim that the SP One is a quality near field performer, even on a low audible level. I pick up on this point because the majority of computer audiophiles will likely be using the SP One in a near field configuration so it is vitally important, even with a mild inswing of the cabinets, that the speakers image clearly and in my case with particular emphasis on a natural sounding midrange tone. That is not to say Celsus do not feel that the SP One can’t fill a room, indeed they quite proudly claim this is not an issue, more of a personal preference on my side. Another key driver for the SP One is the use of carbon fiber rather than traditional paper or Kevlar cones for its woofers. Carbon fiber is traditionally quite expensive and does require a fairly complex crossover at the very top of the range due to their rigidity sometimes causing uneven transitions. At the same time, carbon fiber is known to produce superior bass and mid-bass response compared to their paper equivalents. 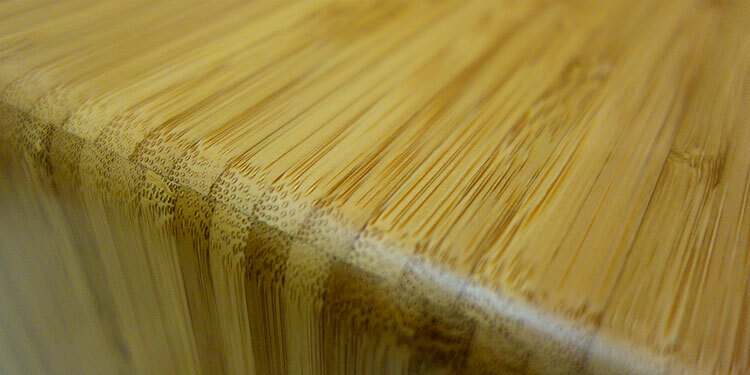 I have seen the word “tactile” used in some commentaries when it comes to Carbon Fiber woofers. The build quality on the SP One is exceptional yet discreet. This is a double cavity cabinet design crafted from solid bamboo rather than some MDF/Bamboo veneer or the usual hardwoods some more expensive speakers use it looks incredibly natural and smooth rather than angular and gaudy. There is nothing hollow sounding when knocked and it lacks any tacky seal joints or exposed screws to the front and sides. The corners are curved or fall away rather than angular making it rather hand friendly. The SP Ones weigh in at 2.3kg and measure 195mm X 130mm X 180mm so whilst fairly low profile they are not lightweight either which is reassuring for issues such as vibration or inadvertent feedback loops (paperweights in computer stores). The front panel of the SP One enclosures is designed and finished with a smooth gray anodized aluminum front panel and houses a 3.5″ carbon fiber woofer and a 1.5″ soft dome, horn-loaded tweeter. Again, it’s a very discreet and simple design with no grills, dome wire cages, screws or protective elements in front. Clearly, the design aesthetic was critical in this aspect but it will risk the possibility of inadvertent damage on the domes so the emphasis here is to not place them in an area with high activity such as kids, pets or similar fast moving “projectiles” even if the tweeter membrane is quite durable to the touch. Always a debatable subject as I know quite a few who prefer grills off then on and swear the sound is better without. Ultimately it depends on the speaker and the grill materials. Certainly, with my old B&W series 2 fronts I had grills off and only put them back on when we had a few people in the living area eating and moving around. As with most active speakers, the rear of the SP One is quite busy looking. Apart from the DC input to the far left you also have a DC 5v USB output socket, wireless/Aux on/off switch, a wireless reset and pair button, single set of speaker binding posts to carry the active signal from right to left and a set of RCA unbalanced input sockets for interfacing with your source of choice, for example a DAC analog outputs or a DAP line out to dual RCA. Volume is controlled by a large black analog potentiometer just above the dual RCA. Finally, just below the bass port, you have the wireless antenna socket which does add a small amount of additional length to the SP One right speaker when screwed it as it is bi-directional with a short stalk and hinge mechanism. 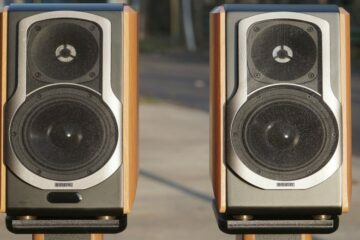 The left speaker is flush apart from the bass port and a set of left-right speaker binding posts. 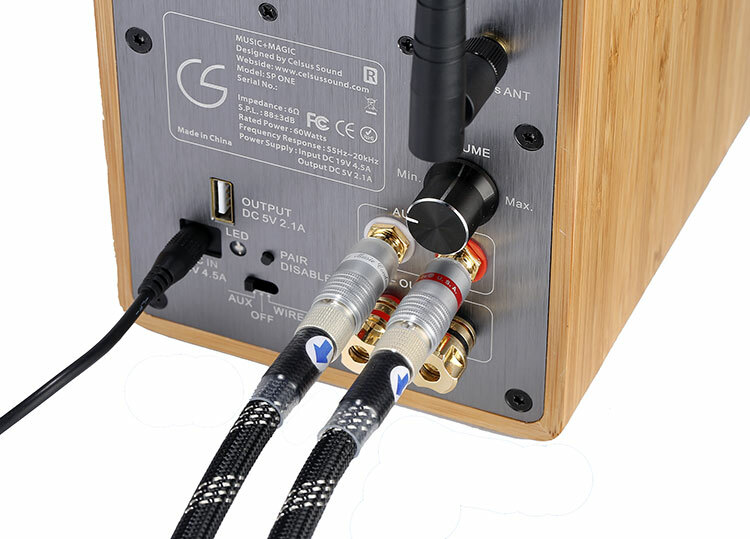 Just as a note the binding posts and dual RCA are gold plated with the posts themselves compatible with banana plugs. Personally, I used banana plugs over inserting the wires directing into the screw down post. They are much more convenient to use and do a better job at preventing corrosion than bare wire, particularly in these humid climes. The only caveat I have with the SP One build quality are the sticky feet they come packed with. As of the time of writing they are rubber stick on dimples and of slightly uneven quality meaning the SP Ones had a tough time getting set on my table. I cured this by swapping them out for thicker grooved pads and inserting them in similar patterns to the base of the speaker. I believe Celsus One have acknowledged that the current pads are not stable enough so your newer editions will have thicker and softer silicone versions. Whilst the SP One can come in slightly cheaper if you choose the passive model ($499) but it is the active model that has the Bluetooth wireless functionality. The SP One Active is fully up to speed on BT tech also with a 4.0 Bluetooth transmitter and receiver module with aptX technology meaning you should be able to get a better extension to your distance from the source as well as a better grade of signal and slightly less compressed one at that. In short, it should not sound murky and lacking in dynamics. The wired analog signal is received via a traditional dual RCA input from either a preamp or DAC (or hybrid) unbalanced output. The active circuit is housed in the right signal and is connected to the left passive speaker via the speaker bindings posts and a set of short speaker cables that come with the SP Ones. 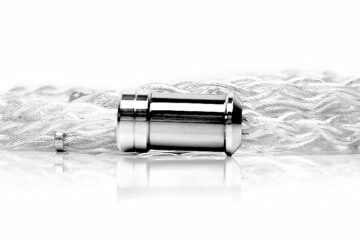 It can handle up to 60w into 6 ohms also if you are pre-amping with an average sensitivity rating of 88dB which places it in the typical median range of speaker efficiency ratings. 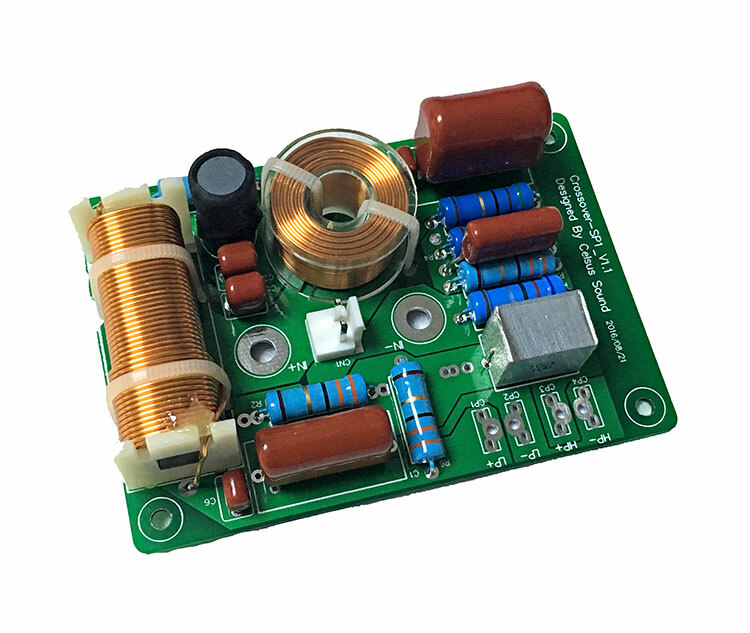 Sitting in a near field configuration they shouldn’t require anything more than 1 – 2 watt (2.8v) in their passive configuration. Technically my setup is a touch close to some concrete walls in a near field configuration so my dispersion loss is going to be quite low and my dB gain from placement a touch higher so I won’t need anywhere near the level of power the active amp can offer however my guess is the max room space on these speakers is about 20 feet (avoiding cornering) before they start to tap out.